The natural tonic has several uses and benefits for health if taken in moderation. Apple cider vinegar is made by fermenting apples with yeast which converts the sugar content in apples into alcohol followed by acetic acid. Various benefits of apple cider vinegar include weight loss by burning fats, lower cholesterol levels, and decrease blood sugar levels. Apart from the benefits, apple cider vinegar may also have various side effects depending on the quantity used and method of taking it. If you have been wondering about why did you start feeling sick after drinking apple cider vinegar, you’re in the right place to learn about its side effects. Apple cider vinegar can make the digestion process slow by reducing the amount of food leaving the stomach. Although this can be good in case of weight loss, it can cause problems in diabetic patients having gastroparesis. The condition does not allow the stomach nerves to work properly which results in nausea, bloating or heartburn. Apple cider vinegar should be taken in diluted form as it can be strong enough for the system to digest. The acetic acid content in the vinegar is not good if taken in concentrated form although it has mild effects. Apple cider vinegar is known to feel fuller for longer resulting in appetite control. For example, people who consumed a drink with 25 grams of apple cider vinegar felt nauseous as compared to those who drank plain water. Large doses of apple cider vinegar may be a cause of concern as it will result in bone loss and lower levels of potassium in the body. A woman had to admit in the hospital after drinking apple cider vinegar regularly for 6 years. However the quantity she drank was 250 ml which were diluted in water, it made her suffer from low potassium levels in the blood. She also became a victim of osteoporosis when her bones became brittle. This was believed to have happened because of apple cider vinegar as the minerals in bones were leached to cause brittleness. Teeth are precious bones that only come twice for everyone since childhood. After that, you will have to have expensive treatments to have artificial ones. Tooth enamel gets eroded by various substances including acidic foods and beverages. Acetic acid is also known to damage teeth over time and weaken teeth by stealing away all their minerals. 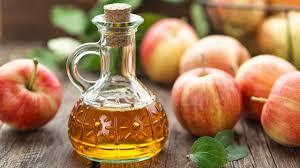 Apple Cider Vinegar is known to cause throat burns as it is a potent caustic substance which should be used carefully. A woman had to suffer from throat burn after 6 months of having lodged an apple cider vinegar tablet. The acidic nature of the acid can cause severe rashes and even burns on the skin Different cases have been reported where adults and children both have suffered from erosion on the skin after having used apple cider vinegar for various purposes. Drugs may interact with apple cider vinegar as they may also work for lowering blood sugar, insulin, cholesterol, potassium levels. The vinegar should not be taken in combination with drugs for diabetes or heart diseases. How to Use Apple Cider Vinegar? Apple Cider Vinegar may be used in moderation to up to 2 tablespoons per day. Rinse your mouth immediately after consuming the acid to prevent teeth erosion. Avoid taking it if you have allergies or suffer from any health condition that could be adversely affected by it. Now that you have the answer to your confusion ” I drank apple cider vinegar and now I feel sick”, you should take caution while taking it in large quantity. You should also avoid regular use of the acid as that will harm you in many ways. However, once in a while is a norm and you may have it in your recipe too. What Are the Different Types of Carbohydrates?